2018 was a rough year for my riding. Winter weather kept me off the bike last year. Less so because it was “bad” weather, and more because I simply didn’t have the right clothes for the conditions. By the time springtime rolled around, I was doing pretty well. Feeling stronger and fitter because my ride frequency was pretty good. Then summer hit – ugh. I started a physically demanding job and I was just too tired to ride very often. So my riding fitness suffered. 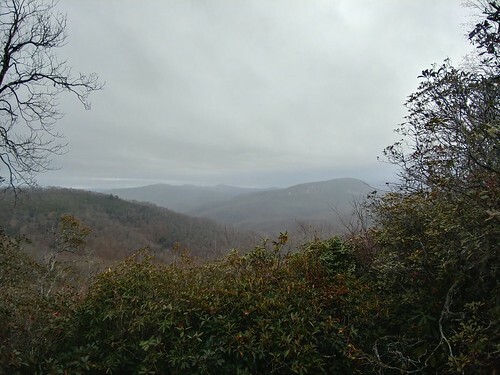 It didn’t help that 2018 was a brutally wet year in Western NC. May, especially. 20-40″ of rain for the month, depending on exactly where you measured. I picked up frequency again in the fall, but my annual mileage was unrecoverably down by this point. I can’t believe I made it almost 3yrs before experiencing significant tire damage to the fatbike tires that I run tubeless on my Bucksaw. Of course, they’re not “designed” as tubeless tires, but they work just fine. 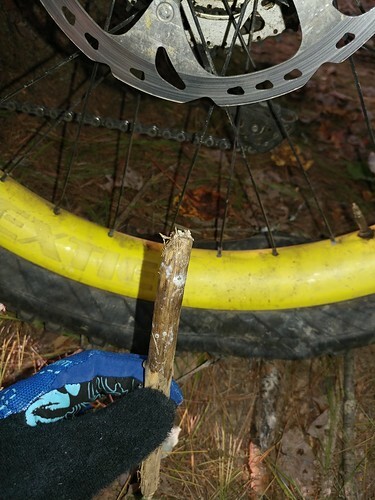 Out on a ride a couple of weeks ago, a stick nearly the size of my thumb punctured my tire. Yowza! Posted on November 10, 2018 Categories Gear, Mountain BikingTags fatbike, mountain bike, mtb, tire, tire repairLeave a comment on My Expensive Fatbike Tire is Damaged! Today seemed like a great day to hide in my basement and work on bikes. In doing a drivetrain swap a couple months ago, I discovered that my hub bearings were gritty. I’m probably a little gun shy over reports of freehub bearings on the Hope fatbike hubs imploding, so maybe I replaced them earlier than absolutely necessary. The new ones are definitely smoother, though. My post isn’t meant to be a step-by-step tutorial on the process. There are plenty of excellent resources available for that. Speaking of which, I found this video to be top notch. The Bryton Rider 310 has been okay, but since Strava ALWAYS throws out wheel sensor data from the device, and RideWithGPS totally mucks up the distance calculations, I decided I wanted something more reliable and versatile. In early January, I was approached by the folks at Bryton to test a GPS of theirs, the Rider 310. 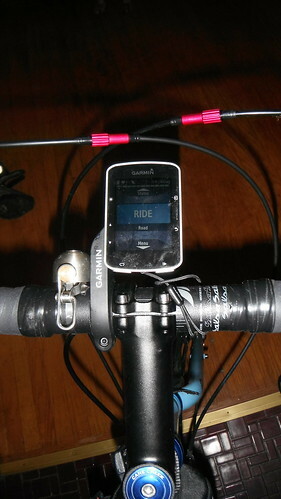 More specifically, they sent me a Rider 310T, which includes a HRM strap (soft strap type) and a cadence sensor. The intended function of the GPS is for use as a basic road bike training GPS. Well, I don’t really use any GPS for its training functions, and Bryton was cool with that. 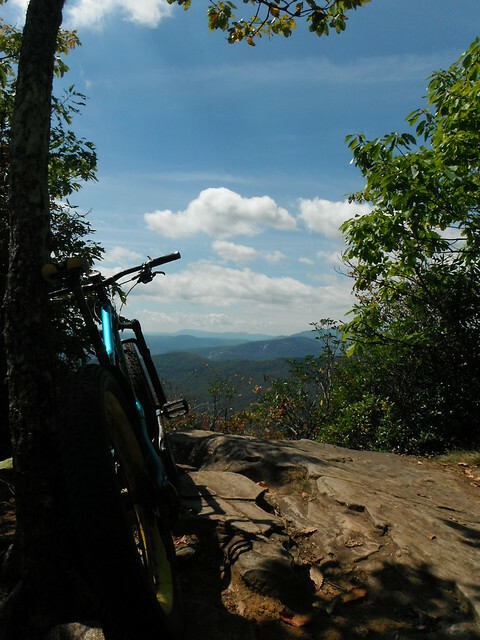 I told them that the sort of riding I do is more recreational tracking with more mountain biking than road biking, and they were also okay with that. My last post about this bike was before I had even finished my own build. I’ve been too busy riding it! Here’s a build summary, followed by my impressions. I got my hands on a GPS accessory recently that I’m quite impressed with. Rec-Mounts is a Japanese company that makes TONS of mounting accessories for lots of applications. They sell some of their products on Amazon, thankfully, because it looks like ordering through their website directly could be difficult. Their products are top notch. I started out with their Type 10 stem spacer mount. Couple things I like about the products this company makes. Namely, their modularity. They use a number of fairly standard mounting systems so a lot of their stuff is interchangeable. The Type 10 mount has a GoPro adapter as the adjustable pivot. So I can pull the 1/4 turn adapter off and put something else there to mount a different computer. This is some old stuff I’ve been dragging my feet on posting. This past winter, I made myself a pair of pogies. They’re awesome, but I do need to tweak them a little for next winter. After going through the process of making them, I’ll discuss what I need to change. Figure out what shape you need. This is a pretty obvious step, but for me it turned out to be the trickiest. I WAS going to post printable patterns, but I’m not 100% pleased with how mine turned out, so I’m not going to share imperfect patterns. Use cardboard to make a mock-up. You need to fit your grips, brake and shifter controls, and have a little bit of extra space. I feel like I could use a little more interior space. At times, it’s a little tight reaching my controls.